Tony Demboski can’t think of a better breakfast than a few brook trout, rolled in flour, salt and pepper and fried alongside eggs and potatoes. “One of the finest-eating fishes there is,” said the 79-year-old resident of Quinnesec, a speck of a town outside of Iron Mountain in Michigan’s western Upper Peninsula. But for years, Demboski said he and other local anglers couldn’t catch enough brook trout for a decent breakfast. That’s because, in 2000, the Natural Resources Commission set a daily catch limit of five brook trout across Michigan, including the U.P.’s 22,000 miles of small streams. “What are you going to do with five brook trout? Nothing,” said Demboski, president of the Upper Peninsula Sportsmen’s Alliance. That resentment began a curious fish tale that’s lasted years, cost taxpayers about $200,000 in research and prompted questions about whether science or special interests drives state natural resources policy. On one side: Demboski and other older anglers who argue that lower limits make fishing less bountiful for Yoopers who eat what they catch. On the other: Angler groups who say the state’s own research shows higher limits conserve brook trout and help sport fishing in general. After years of lobbying, Demboski and other Yoopers persuaded regulators to increase the limit in 2017. The Natural Resources Commission, a seven-member group that sets policy for the Department of Natural Resources, doubled the limit to 10 on 33 U.P. streams stretching 1,200 miles while leaving it at five elsewhere in the state. Fifteen months later, the brook trout brouhaha is still bubbling as the April 27 start of trout season approaches on Michigan streams. In December, the NRC voted to return all streams of the five-trout limit of seasons past. That may have been an accident. A clerical error removed the 33 streams from a wide-ranging order covering changes in several fisheries regulations. Commissioners approved that order, but some later admitted they didn’t read the whole 96-page document. A map from a Department of Natural Resources presentation shows streams slated for a 10-brook trout daily limit — if the Natural Resources Commission reverses a vote some called an error. Now, in a rare move, the NRC will consider changing course yet again when it meets April 11, by voting to reinstate the intended 10-fish limit on 33 streams before the start of trout season. Fellow commissioner John Walters, though, said he understood his December vote. He contends the five-trout limit should remain to protect not only the fish, but the integrity of the commission. “It’s important that whenever we have changes in the regulation — that we read what we’re supposed to be voting on, and that’s what I did,” said Walters of Vanderbilt, a former Trout Unlimited chairman who joined the commission just days after the 2017 bag limit change. ‘Disrespect’ for Michigan’s state fish? Trout have enchanted Michiganders for generations. Trout is so beloved it became the state fish in 1965. Then 23 years later, lawmakers bestowed the title solely on brook trout, a native to the cold, clean streams of the Upper Peninsula and northern Lower Peninsula. For most of the past two decades, Michigan limited anglers to five brook trout on most lakes and streams. That irked some Yoopers who felt the regulations made fishing less fruitful. Proponents argued that boosting the limit might increase participation at a time when Michigan’s ranks of anglers were already declining, down to 880,000 in 2014 from 965,000 in 2009. 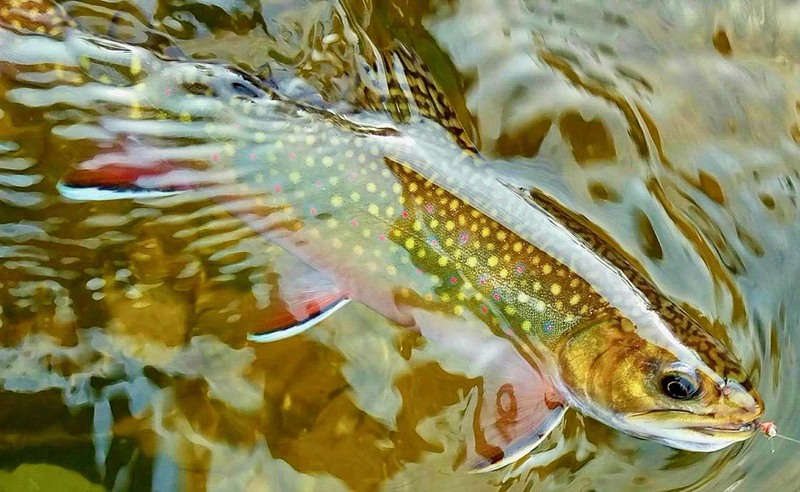 In 2012, some NRC members began calling for higher brook trout limits across U.P. streams. Two U.P. commissioners who have since left the board — J.R. Richardson and John Matonich — were among the leading voices. Their calls prompted four years of DNR research at a cost of nearly $200,000. While not definitive, a DNR stream survey suggested brook trout populations are highly variable and lifting the limit “has potential to deplete local [populations],” according to an agency report that tracked with data regulators had gathered two decades ago. A separate DNR survey of 1,400 anglers found higher limits might discourage fishing by making many think the streams were overfished. Nearly twice as many anglers opposed the 10-trout rule compared to those who supported it, according to the survey, with Lower Peninsula residents overwhelmingly backing the five-trout limit. Even Yoopers narrowly preferred the five-trout rule. Just one group backed doubling the limit: Those who had fished for more than 60 years. The older the angler, the more likely they were to want 10 brook trout. “There does not appear to be widespread support for raising the daily possession limit for brook trout. In general, catch rates and the opportunity to catch larger fish were more important to anglers than catching fish to eat,” the DNR concluded in the 2012 survey. Since then, additional studies have drawn similar conclusions. Citing those findings in 2017, Jim Dexter, the DNR fisheries chief, recommended keeping catch limits at five. But NRC members wanted a change. At the direction of then-DNR Director Keith Creagh, Dexter’s crew chose 33 streams for 10-trout limits. They were scattered across the U.P., ranging from a stretch of the Iron River to the north branch of the Pine River. Higher limits would be less risky along those streams – and be a goodwill gesture to folks who fish for food rather than sport, Dexter said. Dexter said the change shouldn’t have much effect on brook trout populations, since it only applies to roughly 10 percent of U.P. streams. “We stand much more of a threat to lose populations from something like climate change than we do from the regulations we put in place,” Dexter said. That didn’t satisfy Trout Unlimited. Burroughs, the group’s executive director, said the NRC should base its votes on science, and increasing catch limits to placate some anglers sets a bad precedent. An excerpt from the Michigan Department of Natural Resources’ 2018 trout management plan. The document suggests science does not support the state’s new limit for brook trout. Burroughs said his faith in the commission has “deteriorated badly,” pointing to a passage in the state’s inland trout management plan that flags the new limit as “speculative or not well-supported by scientific evidence.” His group is ready for a legal challenge of the 10-trout limit, if need be. Walters, the only NRC commissioner vocally opposed to the 10-trout limit, points out that Yoopers as a whole offered more support for the lower limit. He said it’s “appalling” to suggest five trout fall short of a good meal. “The brook trout, being our state fish, needs a heck of a lot more respect than it’s getting,” Walters told Bridge. Unexpectedly, Walters got another chance to voice his opinion after the NRC returned to the five-trout limit across the U.P. — the vote some called an accident. It happened in December, after the NRC debated — but ultimately declined to — double catch limits on seven more stretches of U.P. streams. In deleting mention of those seven stretches on a broad policy order that needed NRC approval, a DNR staffer accidentally erased reference to the original 33 streams, said DNR Director Dan Eichinger, who took office in January. The NRC publicly approved that order by a 6-1 vote in December, unceremoniously returning all U.P. streams to five brook trout limits. “It was awfully clumsy how that process unfolded,” said Eichinger, who could not remember a similar hiccup in years of work in conservation policy. Now, the NRC is geared up for a redo in April. Approving the new order will allow regulators to test the 10-trout policy over more time, said Pontz, the commission chair. “Let’s take care of our wildlife and fisheries first, and the fisheries and wildlife will take care of the hunter and the angler,” Walters told Bridge. As for Demboski, he hopes to return to his favorite spots along the Iron and Ontonagon rivers after a broken leg sidelined him last year. Maybe he’ll catch and keep 10 brook trout in a day if the NRC votes as expected. 1. "Commissioners approved that order, but some later admitted they didn’t read the whole 96-page document." These commissioners need to resign. If you don't have the time to do the work or if you're lazy, just leave. 2. 5 brookies aren't enough for breakfast? Add 2 or 3 eggs which might cost 50 cents. 3. Can the State of Michigan put science first? Seems like the only question is whether elderly angers really have to eat more than five trout a day. I was one of five kids who grew up eating brookies that our father caught one or two at a time, cleaned, and froze. Made for a very special Sunday lunch about once a month. In policymaking, it seems there is always encouragement of input from interested parties accompanied by complaints about "special interests." Can somebody explain the difference between "interested parties" and "special interests?" Someone once told me the former was someone you agreed with and the latter was someone you disagreed with. Is that about right? Where can I get a print of the trout that is at the beginning of this article? Why not have a special license for those who need/ask for the higher limit....just issue a few and make sure there are enough in the areas where there is a demand...in the UP...for the Srs. who carry on their personal tradition of eating what you catch and clean as an actual sustinance fishing ethic. Here is a question to ponder. We had over 80,000 people who spoke out against letting Nestle steal Michigan water. Why is Nestle still in Michigan and why are they allowed to destroy downstate trout streams? And... Why is Chicago allowed to maintain an unnatural hole in the bottom of Lake Michigan draining billions of gallons out of this basin and giving access to invasive species we will never rid ourselves of? Chicago reversed the flow of the Chicago river to stop the filth in the river from polluting the lake. "Fishing up here is a lot different than fishing down there." Even if it is better (and it isn't) wouldn't you want to keep it that way instead of exploit it? The game laws have become so complicated I'm afraid to fish. I went to dnr in Gaylord to ask some questions and even they couldn't answer them. Raise the limit to 25 Brook Trout per day on these U.P. streams. Let the greedy anglers fish them out and then debate if science isn't the best way to go. Tradition does not make for good regulations. Very well put. If this was such an important vote, maybe try reading it.